It will likely come as no surprise that the events and elements commonly identified as decisive features of modern Korean history have also shaped the narrative landscapes of the country�¯s best-known contemporary novels. Partition, industrialization, and the rapidly changing social norms and values of the past half-century form the backdrop against which have emerged some of the most unique voices in modern Korean fiction. Asia Publishers released Bi-lingual Edition: Modern Korean Literature, a series of bilingual editions of 15 representative Korean short stories written over the last 50 years. Each novella includes the complete original Korean text alongside the English translation, and the series is grouped by theme. A new fifteen-volume series of Korean short stories was released in July featuring works by some of Korea's representative modern fiction authors. As bilingual editions, the volumes feature both the original Korean and translated English texts (photos courtesy of Asia Publishers). The theme of partition and division following the Korean War features prominently in the first five of the selected stories: 'The Wounded' by Yi Cheong-jun, 'Soul of Darkness' by Kim Won-il, 'Sun-i Samchon' by Hyun Ki-yong, 'Mother's Stake 1' by Pak Wanseo and 'The Land of the Banished' by Jo Jung-rae. Yi's The Wounded, one of the author's earlier stories, conveys the disillusionment of youths in postwar Korea as lived out by two brothers, the older who carries vivid, searing memories of the war and the younger who clings to the outer trappings of a pain no less real for being mostly projected. The author, himself regarded as a key writer of the 'April 19 Generation, which refers to those involved in the short-lived student movement that rallied for democracy in April 1960, is also famous for his later novella Seopyeonje. The story of traveling pansori singers was later made into a feature film that brought new attention to the traditional genre. 'Mother's Stake 1, the first of a three-part volume, looks at the complex, intertwining history of politics, culture, and family in Korea through the eyes of a mother of five who struggles to bear the pain of losing her older brother to the war and losing her country to partition. Author Pak became one of Korea's most popular writers after publishing her first work at the age of 40. Though it is clear that both her writings and her personal life speak of the tragedy of Korea's experiences with colonization and war, she has been described by translator Stephen Epstein as one who stood in the middle of tragedy without being overcome by it. The effects of industrialization on Korean society are explored in the next five stories: 'Record of a Journey to Mujin' by Kim Seung-ok, 'The Road to Sampo' by Hwang Sok-yong, 'The Man Who was Left as Nine Pairs of Shoes' by Yun Heung-gil, 'Our Friend's Homecoming' by Shin Sang-ung, and 'The Poet of Wonmi-dong' by Yang Kwi-ja. 'The Road to Sampo' portrays the lives of laborers who wander through the ever-changing landscape of Korea mid-industrialization, longing for the physical and spiritual homes that they have left behind. Works by Hwang, who was as well-known for his political activism as his depictions of the instabilities and contradictions that marked Korea's transition period, have been translated into Japanese, Chinese, German, French, and Swedish. Last June, the author visited Sweden after his novel The Old Garden was selected as the 2011 book of the year by various local newspapers. The final five volumes in the series look at the shifting attitudes and roles assumed by and for women in Korean society during the past decades of transformation. Diverse experiences are presented by the female authors in the following works: 'Chinatown' by Oh Jung-hee, 'The Place Where the Harmonium Was' by Shin Kyung-sook, 'The Last of Hanak'o' by Choe Yun, 'Human Decency' by Gong Jiyong, and 'Poor Man's Wife' by Eun Hee-kyung. Oh's 'Chinatown' follows the life of a nine-year-old girl who flees with her family to the outskirts of the port city of Incheon after the outbreak of war. In a former Chinese settlement bordered by military camp towns and the general debris of post-war decline, the young girl confronts in her own ways the realities of death and the inevitable awareness that comes with age. Choe's 'The Last of Hanak' explores the dynamics of social marginalization and the attitudes that enable it through the story of a female college student who struggles to be accepted and understood by the mostly male members of a social group. The two authors met with readers and critics to discuss their works and the newly published series at a book concert on July 25. 'The Place Where the Harmonium Stood' is the first of Shin Kyung-sook's short stories to be published in English. As with many of the authors featured in the new series, Shin has become an internationally recognized name. Last March, she became the first Korean and the only woman to win the Man Asian Literary Prize for Please Look After Mom, which has been distributed in 19 countries to date. 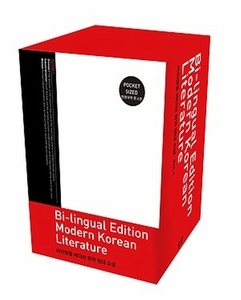 A 15-volume series of modern Korean literature has been published in a Korean-English bilingual edition, its publisher Asia Publishers said. It took five years for the publishing company to release the series, which includes Oh Jung-hee's 'Chinatown, Choe Yun's 'The Last of Hanak'o' and Jo Jung-rae's 'The Land of the Vanished'. Titled 'Bi-lingual Edition Modern Korean Literature,the series is divided into three different sections: Division,Industrialization and Women. While the series' Division section contains fiction works that deal with the Korean War and the post-war period, including Yi Cheong-jun's 'The Wounded' and Park Wan-suh's 'Mother's Stake 1',its Industrialization section features works that delve deep into Korea's modernization and rapid economic growth. The section includes Yang Kwi-ja's 'The Poet of Wonmi-dong' and Kim Seung-ok's 'Record of a Journey to Mujin'. "I used to read a lot of bilingual editions of foreign novels when I was young", said author Oh Jung-hee, whose novel 'Chinatown' has been included in the series. So it's interesting to see my own novel being published in a bilingual edition. The last section, which includes five novels by female writers, explores women's roles and issues in modern Korea. The section includes Gong Ji-young's 'Human Decency', Shin Kyung-sook's 'The Place where the Harmonium Was', and Eun Hee-kyung's 'Poor Man's Wife'. Some of the most esteemed English-Korean translators participated in the project, including Bruce Fulton, Ju-chan Fulton and David R. McCann of Harvard University. "The translators asked me a lot of questions as they were translating," said author Choe Yun, whose novel 'The Last of Hanak'o' has been included in the series. "I once had to stay at this translating institute in Canada for a week just to answer their questions. And I appreciated their effort to be accurate." The series will be sold in both Korea and the U.S., and will be used as class material for Korean studies courses at Harvard University, Columbia University and University of British Columbia in Vancouver, Canada, Asia Publishers said. According to Asia Publishers' executive editor Bang Hyun-seok, the publishing house is planning to expand the series to 50 volumes by the end of this year, by adding more sections such as 'Avant-garde', 'Freedom' and 'Diaspora'.